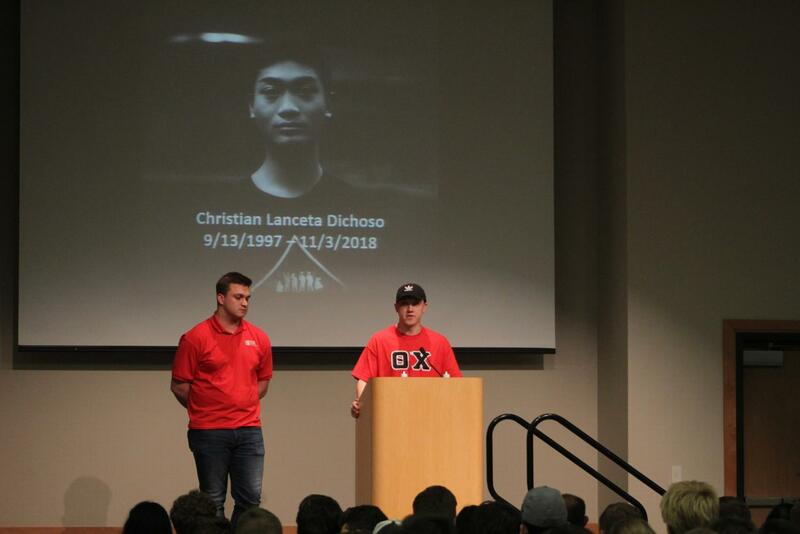 Theta Chi Fraternity President Ethan Poweleit (L) and Interfraternity Council President Isaac Dailey (R) spoke on the creation of the Christian "Jet Li" Dichoso Memorial scholarship at the vigil on Tuesday, Nov. 6, 2018. On Tuesday, the ballroom had a table in the back to write letters to the family of Christian “Jet Li” Dichoso, a 21-year-old student who died Saturday. The audience reminisced on the life that Dischoso led and the effect he had on them, refusing to forget him and his impact. Theta Chi, along with the Interfraternity Council, said that they will be creating a scholarship in memorial of Dichoso. The Christian “Jet Li” Dichoso Memorial scholarship will be going to a student who is in a fraternity on campus. The floor then opened for students to share the impact that Dichoso had on them. The first to speak was Dichoso’s aunt, Joy Coronel. She read a letter that she wrote for him, in which she recalled moments of Dichoso’s childhood—babysitting his “mischievous self” and seeing him grow over the years. “And that is how I remember you for so long: Little, naughty, charming Christian with his sly little grin,” Coronel said. 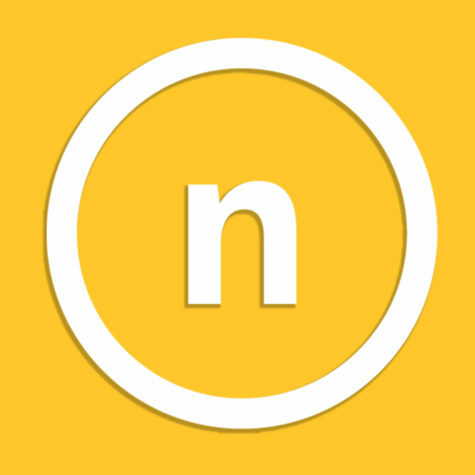 “But then in the fall of 2015, you began your first year at NKU and I began my first teaching internship at the University of Cincinnati.” She had met different, self-assured, mature young man. He was an inspiration to her. The way Dichoso ran toward his dreams was what made her proud. “Shine bright my dearest Christian; I’ll be looking for you among the stars. Love always, Auntie Joy,” she said. 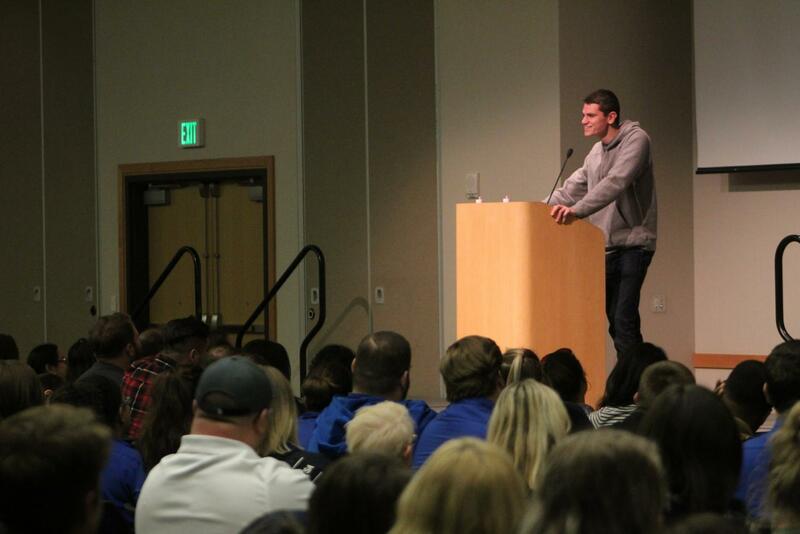 Longtime friend and student Derek Holden spoke about his attachment to Dichoso. The two met in sixth grade and stuck by each other ever since, and Holden said Dichoso made college more bearable for him. “I didn’t have a lot of friends coming into college, a lot of them went to other schools and Christian and I stood by each other,” Holden said. Holden said Dichoso’s mischievous side never waned through the years, and he recalls Dichoso switching pieces while they played Risk, making comments while the teacher gave their lesson. Nicole Millward, another close friend of Dichoso, spoke as well. “Basically Christian and I were boyfriend and girlfriend, but unfortunately we were unable to put a label on it,” Millward said. She recalled her final day with Dichoso. The two were shopping for a semiformal dance they would be attending together. The story behind the name, according to senior Caleb Tiller, originated in high school after Dichoso was taunted by another student. But the teasing didn’t discourage him. “He owned it, and proactively called himself that to take the power out of that. Use it as a way to put a positive spin on it as who he was as a person,” Tiller said. It was such a popular nickname, many student speakers said they at some point believed Dichoso’s real name was Jet. Curtis Adamson, Assistant Director of University Housing, met Dichoso when he was a freshman moving into Norse Hall. There had been an issue with a roommate and Dichoso went to the Housing office to speak with Adamson. Adamson then said he asked Dichoso what he planned on doing in his future. Dichoso answered and immediately reversed the question to Adamson. Junior Noah Cullen speaks about his roommate Christian Dichoso at an evening vigil on Nov. 6, 2018. “‘Well I’m a hall director,’” Adamson said. “‘No, what are your aspirations?’” Dichoso asked. Moments like these were showcased throughout the night, the moments when Dichoso wanted to know the person the best that he could. It’s exactly what attracted Noah Cullen, his Theta Chi Fraternity little, to him. Cullen met him at an event and knew he wanted the energetic and constantly compassionate Dichoso as his big. The pair were also roommates. Nonetheless, Cullen knows he’s not “completely gone,” for he will always carry a part of Dichoso with him. “The last thing he said to me, I was leaving for a party and [he said], ‘if you need anything, need me to pick you up, just let me know and I’ll come and get you.’ Even everything he was going through, at that time, he would’ve put it all aside because he loved me. And he loved so many people, and that’s all I can ask for as a friend, as a mentor as anyone,” Cullen said. NKU’s Health and Wellness Center also made counselors available at the vigil, which was attended by hundreds of people. Click here to learn more about signs of suicidal behavior.